Oval, rigid, cedar root bundle construction, coiled basket. Tump line is braided and woven cornhusk. Partially imbricated geoimetric design. 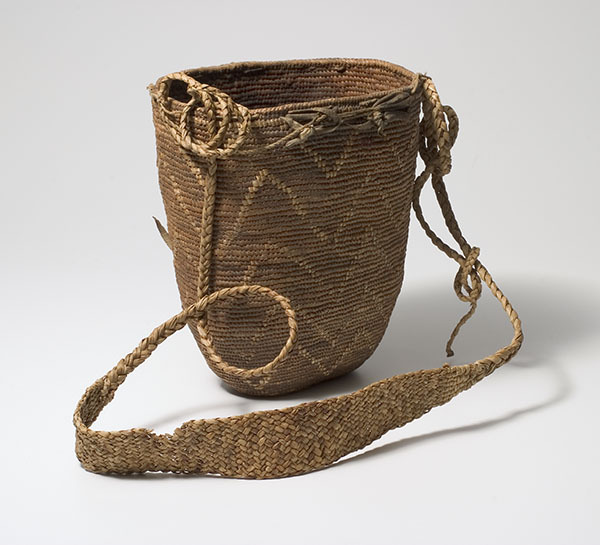 Buckskin loops and ties around rim., height: 12"; depth: 8"; width: 10", William Manning organized his collection by categories listing this basket in the category: Hard Weave Baskets and noting its origin as "Joseph Band, Colville Reservation, Wash." Source: Accession record 1, Northwest Museum of Arts & Culture, 1926 W. M. Manning Indian Collection inventory.